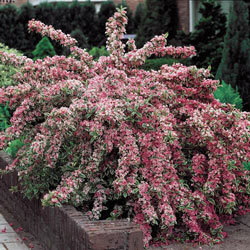 Pink Splash Variegated Weigela is so vibrant and colorful that there is no denying its abundant beauty. 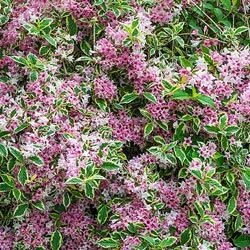 This showy shrub will add pizzazz to your borders with its charming deep rose blooms and elegantly etched green and white foliage. Foliage Type: New growth is soft medium green, broadly edged with creamy white. Leaves are oval, toothed. Mature color is dark green in the center with lime green margins. Flower Form: 1" Foxglovelike flower, funnel-shaped in lower half, bell-shaped above with 5 spreading petals. Planting Instructions: Set plant at the same level it is growing at in the container. Firm soil well and water thoroughly. Soil Requirements: Well-drained, average soil. Not too dry. Pruning: Prune to shape or to remove dead and broken branches. After flowering. Winter Care: Mulch in northern climates after the ground freezes to prevent heaving of plants caused by alternate freezing and thawing temperatures. Additional Information: Weigela named after German professor Christian Ehrenfried Weigel, who died in 1831.